We welcome our colleagues in the industry to contact us about wholesale quantities! Below you will find a list of our most current wholesale offerings. Chrysocolla, Malachite, Drusy Quartz, Selenite, Gem Silica, and More! Incredible pieces from Peru. We were fortunate enough to be able to personally select a lot of this very scarce material, which comes from the popular Lily Mine in Peru. These pieces are amazingly diverse, and feature a riot of contrasting colors and textures. Click here for a gallery of some representative pieces. 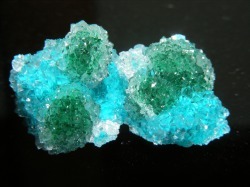 pieces from this material contain combinations of Gem Silica, Selenite, Chrysocolla, Malachite, Atacamite, Calcite, and Quartz. Many of the pieces featuring gem silica and drusy Chrysocolla command a premium because of their popularity for use in jewelry. You can check out our Mineral Specimens page for an idea of the retail price. Material from this shipment is widely varied in terms of price and quality. Keystone prices would be about half of retail for individual pieces, but we also offer wholesale lots of six pieces for $400, which include a mixture of smaller and larger pieces. We would be happy to forward photos of such lots to prospective buyers, or we will work with you to tailor lots to better suit your client base. Have a look at our Lily Mine gallery for an idea of the material we have. ~Clusters of large pyritohedral crystals (well over 1" across). ~Sizable (>1" on edge) modified-cube floater crystals, many of which have some recrystallization. 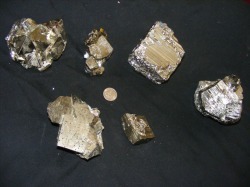 Please see our pyrite gallery for a representative sample of what is available. In addition, we have very limited quantities of larger pieces, many with crystals greater than 2" on edge. Many of these are floaters, show recrystallization, or have aesthetic sprinklings of associated Sphalerite. Please feel free to contact us if you have any interest in these larger pieces.